TNR -- TV News and Reviews: Kathy Bates Elevates "Harry's Law"
Kathy Bates is awesome, and that's pretty much all the reason you need to tune in to Harry's Law. Judging by the pilot, acclaimed writer David E. Kelley (Boston Legal, The Practice, Ally McBeal) has succumbed to cliche in his latest outing, but it's a kinder, gentler cliche that's heartwarming and welcoming. Sure, we've seen the tough, crochety old lawyer fighting for justice for the little guy before. The fun of this series is in the little details, and the pure joy of watching Oscar winner Kathy Bates work her magic. Bates is funny the moment she appears on screen as Harriet Korn, languishing in boredom in her cushy patent lawyer office, watching cartoons and telling her admonishing boss in a droll tone: "I always appreciate your feedback." While the character definitely excels in sarcasm and clever lawyer tricks, Bates wisely chooses not to overplay the "quirky" angle of her character. Despite the plot twists you can see from 3 miles away, you still feel like you're watching a real person. A funny and bright and interesting person, but still someone that you believe could exist in real life. Part of this may be the vulnerability she lends to her character. She's tough and smart, but she doesn't think she's invincible or always making the right decisions. Harry's Law is here. Head over to Yahoo! omg! to find out what other new shows you should be watching out for. *SPOILER ALERT* Despite some of the telegraphed moments in Harry's Law, there are a few scenes of utmost absurdity that I guarantee you won't see coming. One is a man falling out of the sky and landing on top of Harry as she's walking down the street. Not long after she'd miraculously discharged from the hospital with no serious injuries, she gets hit by a car when she steps out into the street--landing on a mattress that a moving company luckily happened to be loading onto a truck at the time. It's absurd and ridiculous, but anyone who watched Ally McBeal or Boston Legal knows that Kelley can make the absurdity gel with the rest of the show, and certainly Bates seems to have a handle on it. The supporting characters are a lot of fun. Nate Cordrry, who was adorably charming in Aaron Sorkin's short-lived but lovely Studio 60 on the Sunset Strip plays up and coming patent lawyer Adam Branch, who admires Harry and decides to take a sabbatical from his job to work for her--after he hits her with his car. Aml Ameen as Malcolm Davies, the jumper who miraculously landed on the lawyer he needed to get out of a "3 strikes" prosecution, hits all the right notes as an earnest young man who's looking for a second chance at life and may find it working for Harry. I also really, really enjoyed Johnny Ray Gill as Damien Winslow, head of the neighborhood "protection" services, who turns out to be not quite the person Harry and Adam think he is. Gill is wonderful as he goes from menacing to sincere with just the slightest shift in his intriguing eyes. I also liked that Harry's assistant Jenna (Brittany Snow) is perky and on her own wavelength, but she's not stupid. Against Harry's protests, she takes all the designer shoe inventory from the old store they've taken over as their law firm, and turns it into a side business that will make them some extra cash while they're building clients. The pilot episode of Harry's Law has all the hallmarks of a pilot--there's that intense level of laying all the clever and interesting and quirky cards on the table right away, and then begging viewers to fall in love with the characters and their noble deeds. Hopefully, with Bates' capable leadership, some of that trying-too-hard atmosphere will smooth out and the show will find its voice and its pace. Once again I'm frustrated by the networks' insistence on trying to cancel each other out. Putting Harry's Law against Castle forces those viewers who are looking for lighter fare to split their vote. Asking me to choose between the awesomeness of Kathy Bates and the awesomeness of Nathan Fillion is just wrong. Guess that's why DVRs, downloads and Hulu have such a booming business. Harry's Law is definitely worth a look if you're tired of heavy, negative, violent drama and soapy doctor's shows and want an entertaining show with likable characters to give you an escape for an hour each week. Kathy Bates is an engaging and enjoyable protagonist, and the show is worth watching just for her. Harry's Law airs on NBC, Monday nights at 10/9c. 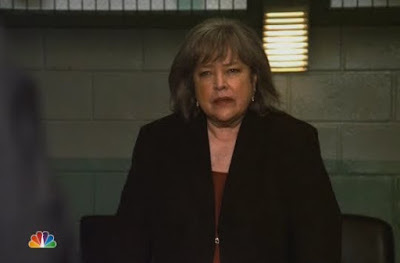 PHOTO: Kathy Bates stars as Harriet "Harry" Korn on Harry's Law screencap c2011 David E. Kelley Prod., Warner Bros. TV, NBC.